I am getting to the point in my pregnancy where it's not so easy to cook new things every day and take photos of it at the same time, plus taking care of my active four year old son. My idea of food right now is hubby bringing me home a nice salad or scrambling some eggs. If I'm really in a mood, throwing some veggies, potatoes and chicken pieces in the oven. So all of this translates into posting a lot of 'leftover' foods that I already cooked and I took the pictures, but they waited patiently for their turn to be posted. 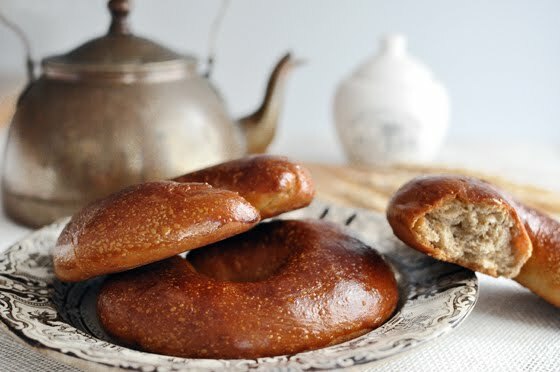 These bagels were part of my Christmas sweets, I cannot imagine Christmas time without them. 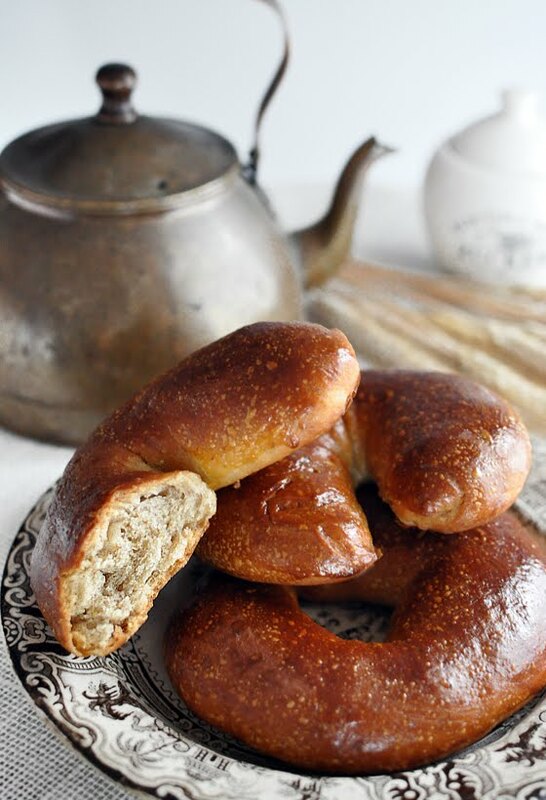 They are a Croatian recipe, to be more accurate, Dalmatian recipe, but I actually don't know anyone else that makes them. Who knows where my grandma got the recipe from! Once you figure it out (translates to, your mom gives you the full recipe), they are easy to make, you just need to give them enough time for proofing. Put the flour, orange peel, salt and spices in the mixing bowl with your bread kneading attachment and add the olive oil. Slowly start mixing and adding sugar with water, add yeast last. You are looking to dough consistency similar to the one you make for bread. If it's too firm add a bit more water. Knead it together in mixer for a few minutes then transfer into a bowl and set into warm place to proof for minimum of 3 hours. I like to let it for 4 or even 5 hours. 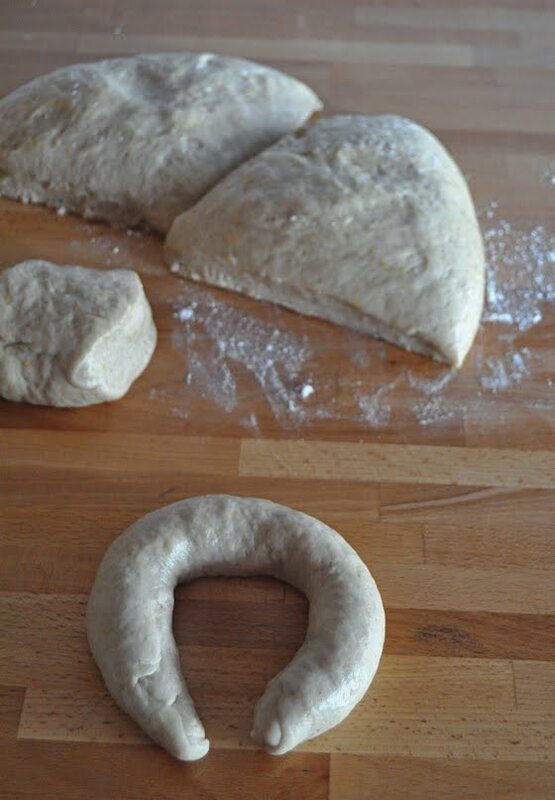 Transfer the dough onto lightly floured surface and divide into 14 pieces. 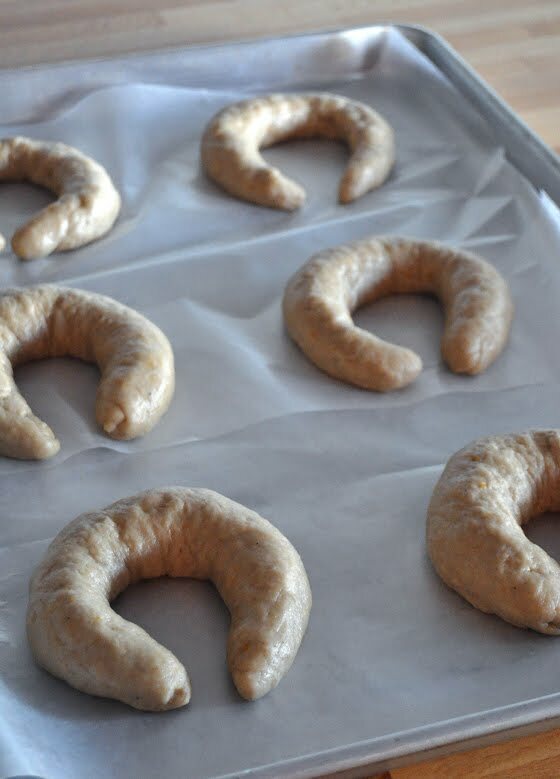 You will roll each into a thick snake and make almost a bagel shape, but don't connect them, leave about an inch of space between two ends. Put them on baking paper and on to the baking sheet, cover them with a towel and let them rise again for three hours. Bake the bagels on 350 for 20 minutes. After 10 minutes brush them over with a beaten egg. 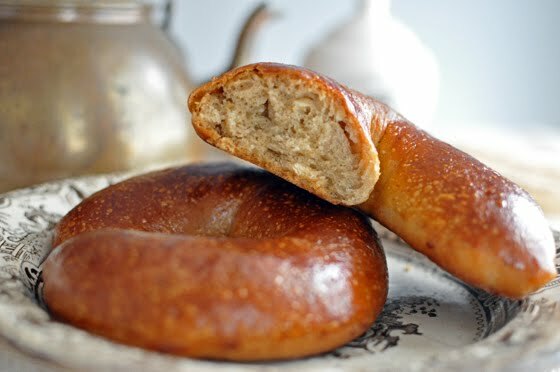 You are looking for a nice deep brown color in a done bagel. 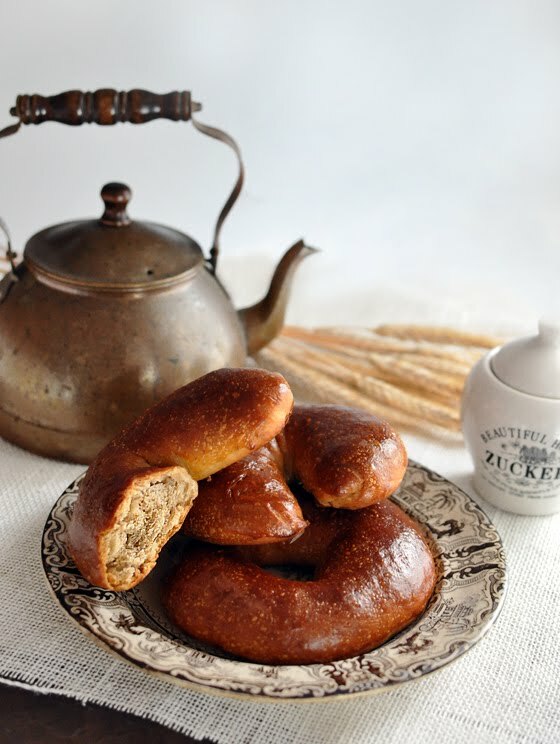 They are yummy when still warm, but I like them best the next and in the following days. They are best kept in a zip lock bag for up to 10 to 12 days. This is a dipping bagel. We eat it with coffee, tea, or my favorite is hot cocoa for breakfast or night time snack. It is pretty firm and the flavors are just amazing. It reminds me of holidays and home, but sometimes we 'cheat' during the year and make them because they are just that good!